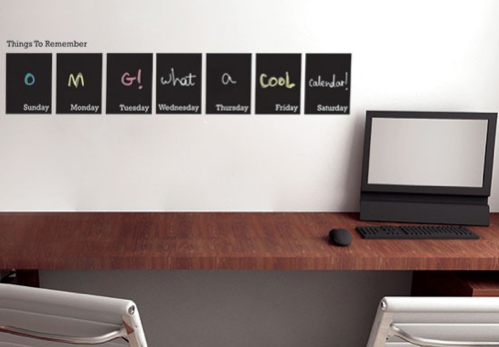 What It Is: A set of seven chalkboard wall decals that easily install and erase so you can jot down your appointments and deadlines at either your home or work office. Stack ’em, line ’em up, rearrange them as you see fit – just make sure whoever you’re purchasing for also receives a fun pack of colourful chalk and an eraser so they can get ‘to work’. Or you know, start doodling. Who It’s For: Your freelancer friend, as a classic touch to her modern office. Your favourite coworker, to jazz up his office and give you both a mid-day diversion. Your daughter, to keep track of her school assignments in a fun way come fall. Your sister (and mother of three), to keep tabs on family activities once fall hits. What It Costs: $24.99 + about $9 shipping. Want another bonus entry into last week’s Elabloom giveaway? Just tell me in the comments below – would you buy these fun decals? ← Flash Post: What’s The Scoop? I do think they’re cool – a great addition to an office or a study area. I probably would buy them for our office. I love them and think they would make a great gift also. I would definitely buy these. They are really cool. My daughter really needs something like this – with all the kids activities and her appointments she needs something to organize her life. I’d buy these. Although I might end up using just one as a notice board. I’d use these for sure! Very cool! I would consider buying them. Functional office art, would buy them! Elabloom bonus entry: I would buy these fun decals ‘cos they come out to about $5 a sheet. Could make a whole calendar on the wall.